This is the second time I post this recipe, but this is an improved version of my original recipe, so I hope you like it. Pozole is a dish that has been eaten in Mexico for centuries, before spaniards conquered us. Maize has always been one of the main ingredients in Mexico, its importance goes back to pre-columbian times, maize was a sacred plant for the Aztecs, pozole has always been cooked since those times for special occasions. 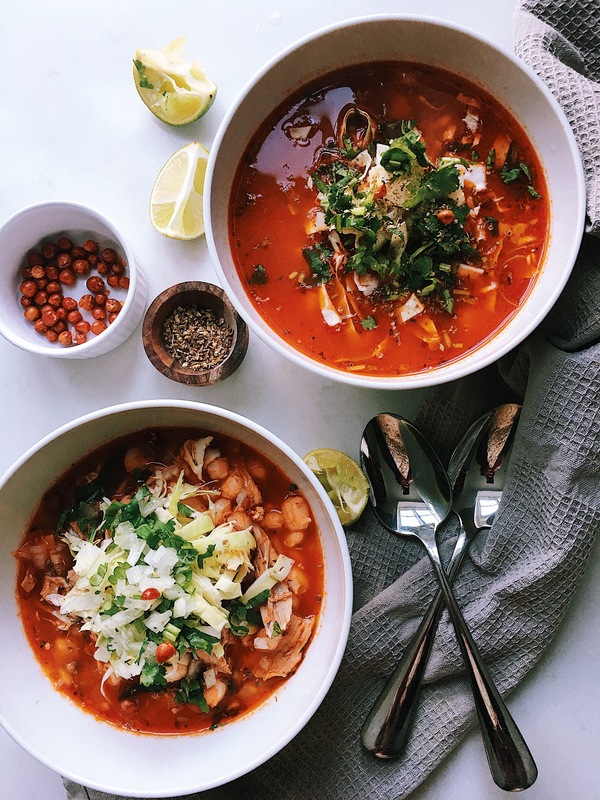 Pozole is a type of stew made with hominy, meat and dry chillies to give flavour to the consommé, it tastes amazing, it is garnished with fresh vegetables so the dish becomes just very cozy. In my family we always eat it with pork and my sister Sonia is the best pozole maker ever! 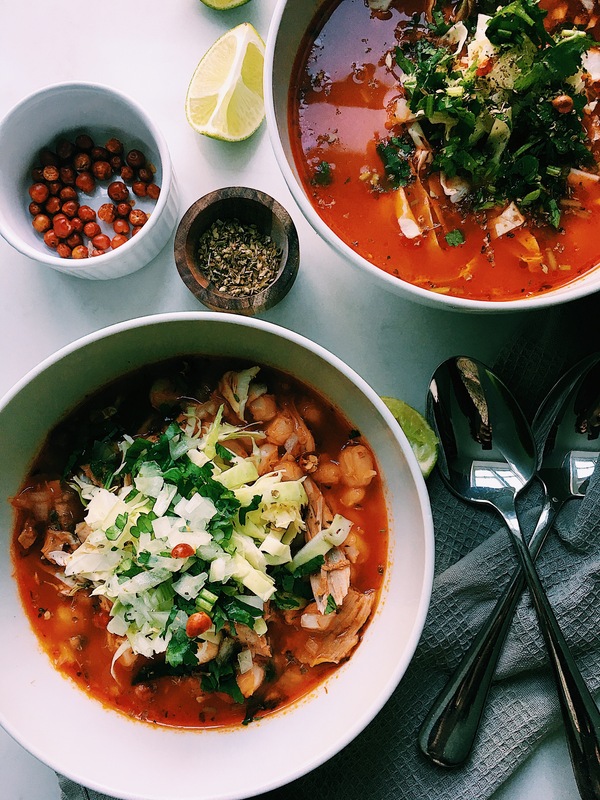 When everybody in my family wants to eat pozole, we all ask her to make it, she kind of has this special touch or maybe she has a secret ingredient, but the pozole she makes always tastes wonderful. We usually cook a massive pot of pozole and when I say massive, I mean “MASSIVE” and believe it or not, it all gets finished. So I hope you get inspired by my little family story and feel brave to try this recipe out. In a large casserole dish put the chicken and cover it with water. Add the bay leaves, garlic, onion, oregano and salt and cook first on medium heat and when starts boiling, turn the heat down to low. Remove the impurities. In the meantime, put the chillies and tomatoes, onion, garlic to cook at medium heat in sauce pan with water just covering the chillies for 15 min, then blend them very well until getting a silk consistency. Set aside. Add the chicken stock cube to the chicken. After an hour, remove the bay leaves, onion and garlic from the chicken. Then add the guajillo salsa and leave to cook for 20 min. Wash the pozole grains very well and add them to the chicken. Check the is well seasoned. Cook for 15 min. Then take the chicken out and shred the meat fromt the bones and put them back to the pozole. Serve it in a bowl, add some shredded cabbage, coriander, onion, slices of radishes and something spicy, it can be a salsa or some chiltepin chilies. Enjoy it with a nice cold beer! !